This new trends in summer food has taken a whole new turn. People are going for food that offers them a different taste from the mundane meals they have been having over the years. Smoky roasted mushroom is one such dish that has captivated thousands of people and have led them to make smoky roasted mushrooms a necessary side dish with their main meal. It has fast become a specialty of world famous hotels. The best thing about this side dish is that it is extremely easy to prepare. Following an easy-to-follow recipe with the right ingredients, you can enjoy the same great taste right in the comfort of your home. Smokey roasted mushrooms are loved by everyone for their extremely good taste. It has quickly become the favorite side dish of food lovers at many restaurants. Immerse yourself in this special summer side dish with a tinge of virgin oil, smoked paprika with classic salt and pepper and enjoy you fully nutritious and healthy meal. 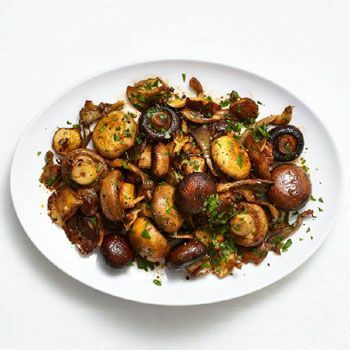 We share with you an easy-to-follow recipe for Smoky Roasted Mushrooms so you can enjoy the summer season with a delicious, mouth-watering side dish. 1. First, take all the mushrooms out of the tin and drain them. Once the water has drained, cut each mushroom in halves. If you prefer whole mushroom in your meal, you can skip the previous step.Many restaurants serve full sized mushrooms and do not cut them, to retain their look. 2. Put olive oil in a pan and keep the heat low. Put all the mushrooms in the preheated oil and sauté until you feel that their color has started to change. 3. Once the mushrooms are half cooked, add butter. It will turn the mushrooms into a little brown color and add aroma and taste to the mushrooms. 4. Add finely sliced garlic cloves in the pan to the mushrooms and stir them all. 6. Toss out the mushrooms in a platter. 7. Finally sprinkle the aromatic herbs, finely chopped parsley on your delicious smoky roasted mushrooms. You are ready to serve this perfect accompaniment with steak or any meal you and your loved ones are having tonight. The garlic and butter addition to mushrooms, give the dish an added flavor. They can also be enjoyed with a simple cream soup, if you are planning to have a light dinner. The above recipe for Smoky Roasted Mushroom will make your dinner not only delicious but also special. Small Tip: Always use freshly canned mushrooms great taste.